The interactive map below shows the current MLS listings of homes for sale in this neighborhood. If you find a home that interests you, or just have a question, call Jim at 512/913-1557. Neighborhood Location: The Lewis Mountain Ranch neighborhoods are located on the west side of Circle C Ranch between US-290 W and W. Slaughter Ln. in SW Austin. 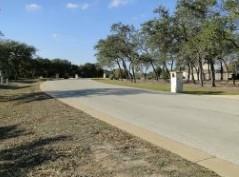 Turn west off of FM-1826 onto either Lewis Mountain Dr. or Blazyk Dr. (the Overlook) into the subdivision. Scroll down to see more info on the neighborhoods of Lewis Mounain Ranch. The following data table gives a snapshot look at the Lewis Mountain Ranch real estate market over the preceding 8 years. 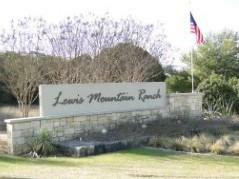 Lewis Mountain Ranch real estate market data from the Austin Board of Realtors, 1/1/2011 - 12/31/2018. Lewis Mountain Ranch had its beginnings in 1990 with the construction and sale of the first houses there. Homes in the initial phases were built in the northern-most section that starts at Lewis Mountain Dr. and stretches westward into the development. Homes in this part of Lewis Mountain Ranch have from 1-4.6 acres of space. The Estates of Lewis Mountain Ranch are located at the northwestern end of Young Ln. in a gated section of the neighborhood. The few homes in this portion of the neighborhood were built circa 1998-2000. They average around 3,500 sq. ft. and are situated on lots of 2-4.6 acres. A southern section of the neighborhood called the Overlook at Lewis Mountain Ranch was built along Blazyk Dr. in the years 1999 through 2005. Homes in this part were typically on 1-1.5 acres, and average somewhere around 4,000 sq. ft. of living space. Some of the best views in Lewis Mountain come from this section! This area is "packed" with mature trees that provide privacy. Wildlife, especially deer, are at home in this area! 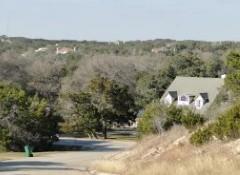 Many of the homes in Lewis Mountain Ranch have greenbelt or great Hill Country views. Some homes and properties back to Slaughter Creek. If you are looking for a pool, many of the homes have them! The prices and sizes of homes in Lewis Mountain Ranch vary widely. Just a few homes sell in a given year--an average of around 6 from 2011-2016. Homes range in size from over 6,900 sq. ft. to around 2,500 sq. ft., and offer residents 3-5 bedrooms, 2-4+ baths and typically 2-3 garage spaces. This subdivision is located very close to SH-45 which provides great access to Mopac for those who want or need to travel north to Austin. The very popular Salt Lick BBQ is a few miles south on FM-1826. Go north on FM-1826 to get to US-290 and the Dripping Springs area. Shopping is not a problem for residents of Lewis Mountain Ranch! Escarpment Village and Parkside Village are easily found via Escarpment Blvd. or W. Slaughter Ln. You can also get to the Shops at Arbor Walk and those in Sunset Valley. Drive north via Mpoac to the Barton Creek Square Mall or east to Southpark Meadows. If you golf, the closest club is the Grey Rock (Circle C Ranch) Golf Club, part of Circle C Ranch. Area places for enjoying the outdoors include the Veloway (biking and roller-blading) and Lady Bird Johnson Wildflower Center, the Metro Park at Circle C, and many places for hiking and biking. Homeowners must maintain a membership in the appropriate HOA. Yearly dues for owners vary with the section of the neighborhood. Tax rates in Lewis Mountain Ranch are lower than in many nearby developments. The neighborhood is not located in the city limits of Austin. Hence, there are not any city taxes. Owners' taxes are assessed primarily by Travis County and the Austin ISD. For the tax 2015, rates were set at approximately $1.93/$100 of property vaue. Students living in the Lewis Mountain Ranch neighborhoods attend the schools of the Austin Independent School District. Please check with the Austin ISD to confirm the assigned schools for Lewis Mountain Ranch. School attendance boundaries are occasionally redrawn.